Most of the 2000 delegates are happy to support and vote for Trump-Pence in 2016. Many of the Christian voters are pleased with the 2016 Platform written and voted for by the 112 member Platform Committee. It has been called “the most Conservative Platform in GOP history!”-For that reason, and I have been tuned in Monday, Tuesday and Wednesday and IMO this is the best GOP Convention I have ever seen! I am a changed person! All year I was tending into the dumps over the Hate Trump accusations and in-fighting. But now I see Light at the end of this Liberal Heck Tunnel we have suffered through 7-1/2 years under the scofflaw Obama-Hillary Regime. I am so happy that I changed my gocomics.com user name! I am no longer “disgustedamerican”…..I thank God for answering my prayers and the prayers of so many others who want to see God rescue the USA from the scrap-pile of history!-We do need to see more public “repenting” by those who fight to maintain the “Status Quo” that Hillary is the Secretary of! LOL. She led the making of “Status Quo” into “The Mess We Are In”!-I began the year supporting Sen. Ted Cruz. 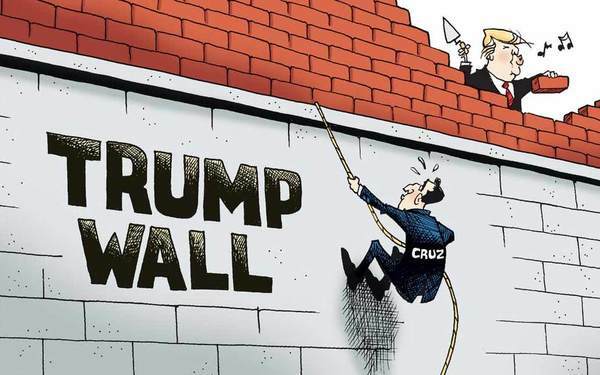 But his “Christian” performance of opposing Trump and opposing the “will of the GOP voters” has brought me to the determination of “Never Cruz” for breaking his promise to “support the GOP Nominee”….as Cruz plans his 2020 campaign. (If the Lord lets me remain that long on earth—-Lord, thy will be done)—-I will not support Cruz in the future.-Shame on those GOP who showed their selfishness and divisiveness and helped Hillary by opposing the choice of the GOP voters! The fate of our Constitutional Republic is hanging on electing the GOP nominee who has shown his willingness to govern in a way that Christians want; a Supreme Court with conservative Justices, a reform of the Injustice department back into the Law and Order DOJ with a new AG….and Christie passed the exam with his speech indicting Hillary on FBI evidences. Etc.-Praise the Lord! 2 Chronicles 7:14. We desire God’s blessings on America, again.